On June 6, 1944, no fewer than 4000 ships landed 133,000 assault troops on the beaches of Normandy. A further 23,000 parachuted in, whilst Allied aircraft flew 14,000 sorties on that historic day. By the end of August 200,000 seamen had transported two million troops across to France. It was the greatest and most successful military invasion in history, which led to the downfall of Hitler's Germany, and the end of the war in Europe. Robert Taylor's painting captures the very essence of that herculean battle. 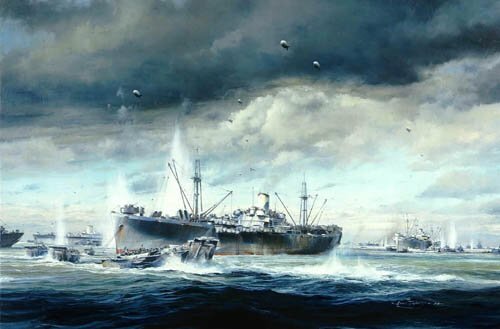 The painting is dominated by one of the many large transport ships, lowering her landing craft under bombardment from shore batteries. Barrage balloons flying, this massive fleet sailed into the teeth of the German defences, to land its invasion forces against all odds.